Routes for which there is conflicting information about their present or past existence. 71 Routes for which no record has been found so far of this number being assigned. (Post-1927 only). History: This road is now the Stanley A. Griego (Santa Cruz) Bridge over the Rio Grande, which carries U.S. 84-285 just west of the junction with NM-68. This route, which was established before the U.S. routes were moved onto the bridge replacing their route 1/4 mile north of this crossing through downtown Española, appears to have been created after 1984 (the USGS topo map updated that year does not show a bridge here) but before 1988, when it would have received a 5xx number. In 1993, AASHTO approved moving U.S. 84-285 onto this road. Comments: Whether this route had the state route ever marked on it is not known, nor is it known when New Mexico actually moved the U.S. routes onto the road. History: Probably created around 1988. Earlier maps do not show a state highway on this road. Comments: I'm not sure whether the route is to connect to the wildlife area or remote parts of the Philmont Scout Ranch. One of the first 200+ routes, one of only two shown on a 1948 map. History: Originally established in the 1920s as NM-18. In the 1988 renumbering, this is the first piece of 18 that received a new number because of concurrencies with U.S. 82 around Lovington. Comments: This is a segment that I would un-do the 1988 renumbering and reestablish as NM-18. History: Although NM-18 was routed through Eunice in the early 1930s until it bypassed that town to the east, the original route does not show on maps as a state highway until the mid-1960s. However, no maps from then until 1988 show a route number for the road through Eunice. It may have been Business 18 or something like that. In any event, it was given this designation in 1988. In 2006, NM-176 was restored over its original route, and NM-207 was terminated at its south junction with 176. The north half of this route was redesignated as NM-248. Improvements: Paved, two lane road. History: Established in 1988 as a west bypass of Hobbs. The southwest side of the loop appears to have been removed from the state highway system in the 1990s. History: Originally part of NM-18. This is the second former segment of NM-18 north of Lovington that was established in 1988. Comments: I wouldn't renumber this as part of NM-18, given that it would require a fairly long concurrent section with U.S. 70. However, this road does directly connect to NM-104, and consolidating these into a single route wouldn't be out of the question. Comments: The only function of this road is to connect the town of Forrest to the state highway system. Comments: Passes through the town of Gila. (Pronounced "Hee'-la"). History: Designated as a state road in the early 1950s but apparently removed within a few years. It does not show up on maps again until 1988. 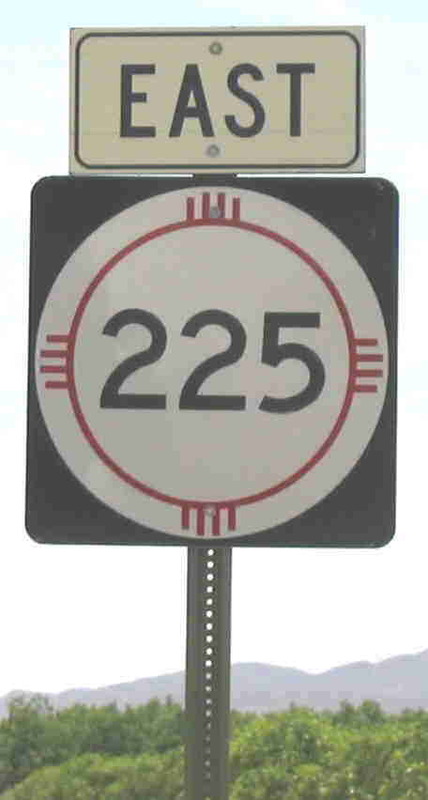 An apparently new road, NM-272, was constructed or improved in the 1990s, and the road south of the monument took this identity. Comments: I don't understand the need for two closely parallel state routes in this area. This is a fairly straight route south from U.S. 60-84 that bends east and ends at NM-272, which has jogged several times in its journey south from U.S. 60-84. History: This route was established early 1950s, before much development of the missile range, and thus extended a few miles further north than you can now go. History: Established late 1940s to connect Ft. Stanton to U.S. 380. Extended south to U.S. 70 a few years later. The southerly portion of this route was turned back to the county in 1994 (it is shown as Lincoln County E-7), and the remainder of this route was consolidated with NM-220, which had been created only a few years earlier. Comments: One of the first 200+ routes, one of only two shown on a 1948 map. History: I only see this on my Benchmark Atlas, but I suspect it was established mid-1980s because if it was established after 1988 it would have probably had a 5xx number. History: Established early 1950s. May have actually begun at NM-222, since that road may have included the south end of 217. History: Likely marked with this number since 1988. May have previously been NM-132. Comments: Follows Bender Blvd. from Dal Paso Street to Marland Blvd. Windshield shot, taken March 2008 along U.S. 54. History: Constructed by around 1980. No previous state route on this alignment. Comments: An important connector between U.S. 84 and 54, and allows traffic from Colorado coming south on I-25 to access U.S. 285 (yes, I've used it). It's surprising there was no good road here until the 1980s. History: Appears to have been established as a state highway in the 1990s. This route was consolidated with the northern part of NM-214 in 1994. Comments: See comments under NM-214 above about conflicting information on when this route was established. The new 2003 New Mexico highway map confirms this alignment. History: Created early 1950s. No significant changes in routing or length since then. Improvements: East half paved, west half gravel. Comments: Segment in Santa Fe County is County Road 7, in Torrance County A-99. (Thanks, Guy Suchomski, for clarifying the ambiguous marking in my Benchmark Atlas. History: Probably established mid-1980s, due to the fact the number does not match the 5xx pattern for post-1988 routes in this area. History: Established early 1950s. No significant changes in alignment or length since then. Photo taken at junction with NM-28. History: Established late 1950s. No significant changes in alignment or length since then. Comments: The first of four routes established at the same time that have consecutive numbers (perfect example of route "clustering.") Anthony is an interesting town, lying both in Texas and New Mexico. The state line bisects a building housing several businesses along the main street. The post office has a New Mexico zip code (beginning with 8 instead of 7), even for "Anthony, TX" addresses. It is known as being the home of the Mountain Pass Canning Company, provider of delicious green chiles now under the Old El Paso name. History: Established late 1950s, originally ended at U.S. 80-85 Alternate (which became NM-478). History: Established late 1950s from NM-28 to U.S. 80-85 Alternate (which became NM-478). In the mid-1960s, it was extended to I-10. In 1988, the original segment became NM-189 because of a short concurrency with NM-478. Comments: This route is marked from I-10 and appears to essentially reach the interstate. History: Established late 1950s from NM-28 to U.S. 80-85 Alternate (which became NM-478). I'm guessing it was mid-1970s when it was extended to I-10 FR 1035. In 1988, the original segment became NM-192 because of a short concurrency with NM-478. Comments: This route terminates on the frontage road perhaps 100 yards from the road where the interstate has an interchange. But, it is marked as ending at the frontage road and the exit from I-10 is merely marked "Mesquite." History: Established 1988 or thereabouts. Comments: Runs parallel to and about three miles east of U.S. 285, bypassing Artesia. I can't tell whether it ever connected to U.S. 285 at Atoka, but the current New Mexico highway map shows that it doesn't. Comments: Begins south of Arroyo Seco at NM-150, as a two-lane, 45 mph road that runs approximately north. Then, turns mostly east and goes through the village of Valdez as a narrow, winding 25 mph road lacking a center stripe. No history of a state route with this number found. Comments: This route only shows on the current state route log. It is very short and thus researching its history will be difficult. History: Originally NM-176. Renumbered as NM-234 in 1988 because of a short concurrent segment with NM-207. In 2006, the NM Transportation Commission reversed the 1988 numbering and restored NM-176 as a continuous route to the Texas line. Comments: Texas had renumbered its corresponding route as 176 to match New Mexico's route number, and then this segment in New Mexico got a new route number. The original numbering concurrency has now been restored. Comments: Despite the 2xx number like those used in the 1988 renumbering in this region, this route designation is actually much older than that. History: Formerly part of U.S. 54, apparently established as separate route late 1990s-early 2000s when a Tucumcari bypass of U.S. 54 was constructed east of the city. Comments: U.S. 54 now bypasses the central part of Tucumcari to the east, and this route, former U.S. 54, carries traffic from 54 into the city. Runs along Railroad Avenue and Main Street. South terminus: NM-529 W of Arkansas Jct. History: Originally the north segment of NM-8. Renumbered in 1988 because of concurrencies with NM-529 and U.S. 62-180. North terminus: Alkali Road N of Carlsbad ??? History: Date of establishment not known. Could be 1988 or after because number fits into 2xx pattern for this area; however, there is an intersecting route also shown (428) that doesn't fit that scheme. Appears to have been decomissioned by 1999, maybe earlier since it doesn't show on the 1995 official state map (though it may just be too short). Comments: Only identified because it shows up on online maps (Mapquest, Yahoo maps). 1999 Benchmark Maps atlas shows the road as County 206. It may have been removed from the state highway system when the Carlsbad Relief Route (NM-200) opened in the late 1990s. Comments: This route's age is hard to determine. If established in or after 1988, it probably would have received a 5xx designation. Because of its short length, however, it may not show on earlier maps. This dead-ends near the Taos plaza about 1/8 mile from NM-68. NM-240 dives underground at the Taos Plaza, just yards from what would be a second intersection with NM-68. Actually, I think the "down" arrow is supposed to indicate "END." It isn't clear why the route isn't extended to the north (left in this photo) for about 1/2 mile along Camino de las Placitas to U.S. 64, which would provide a marked bypass of the very congested Plaza area along U.S. 64 and NM-68. History: Established early 1950s. Consolidated with the east-west segment of NM-93 in 1988. Comments: A loop off of U.S. 62-180, carries the romantic name of Potash Mine Road. History: Originally the northern segment of NM-24. Established as separate route in 1988 because of concurrency with U.S. 82. Comments: Coincidence that the designation appears to be derivative of the old designation, while still being within the series of routes established in this district in 1988? Runs largely within the Mescalero Apache Indian Reservation. History: Formerly the northern leg of NM-48, renumbered in 1988. Comments: Seems odd that the longest segment of this route was the one that was renumbered in 1988. Windshield shot, taken March 2008 along U.S. 54 in Corona. History: Formerly the eastern leg of NM-42, renumbered in 1988. Comments: Just like 246 --- seems odd that the longest segment of this route was the one that was renumbered in 1988. History: When NM-207 (originally Loop 18) was terminated in Eunice when NM-176 was restored to its former routing in 2006, this route took over the former north half of NM-207. It was established to avoid a route overlay with NM-176. History: Formerly the northern segment of NM-31, renumbered in 1988. Comments: Includes a piece of old U.S. 85 and the road to the airport.